This week thru 4/20, ShopRite has Ragu Simply Pasta Sauce priced at only $1.99 each. 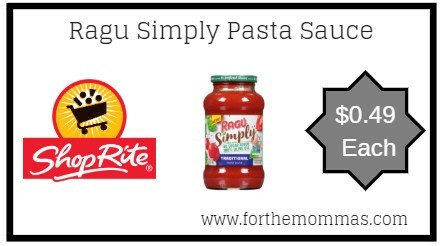 In addition to this, we have a $1/2 Ragu Pasta Sauce printable coupon and a ShopRite digital coupon to use on this deal. Plus, you can earn Ibotta rebates to make your final price $0.49 each.